Here's part one of the Q&A with Jeff Laflam, creator of the upcoming Match & Magic. 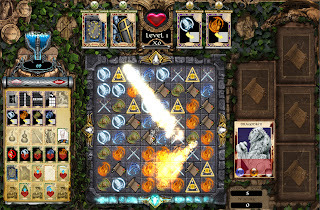 Besides an entirely beautiful playing field, what you're seeing are the visual effect after fire and wind tiles are matched. Also, the player is currently battling a monster (the card in the right panel), and has collected a staggering array of potions/effect cards (left panel). Okay, now part one of the Q&A. Jeff, this game (and you) came out of nowhere. What was your programming backgound before you started the project? I started programming in high school. After that I decided to get my degree in computer science and immediately started working at Intel. By day, I was writing BIOS test tools and database tools, but at night, I started to dabble in what I really wanted to do, which was game programming. I dreamed about doing that ever since my dad brought home our first computer, an Atari 800. I started writing my own games, which were epic in design, but went nowhere. I asked a question in a gaming forum that was basically "How do you finish these big games?" A guy responded by talking about the actual making of the F-16 fighter jet (the real one). He discussed the issues they had with having a super long to-do list and how they ended up using small, attainable lists to make incremental progress at a regular interval. That really put perspective on what I could and couldn’t do. That's when I decided to write some smaller games that had already been made. I started with Mastermind, which took a few hours one weekend. From there I started work on recreating an old WWI fighter game. It took me about 3 months to finish, and it was tough--I had to write everything from scratch. It turned out to be a fun game, but more importantly, it showed me what I needed to go through to actually complete a game from start to finish. That last 10% is literally 90% of the work as they say. What really helped is that the game was already defined… I just needed to recreate it. From there I knew how much I could accomplish by myself, plus I could reuse the code I had previously written to expand upon the scope/level that I did before. I decided I was going to adopt the phrase of “and 1” from basketball. I wanted to make games that were built on existing, well-received game types, but then I wanted to add one thing to them that I thought was even cooler and more fun, hence the "and 1" term. That has been my design philosophy since. How long have you been gaming and what are your favorite games/series? Do you have any particular influences in terms of designers/developers? I’ve been gaming since I was about 8 years old and basically play/try every type of game. I fell in love with Master of Magic, Civilization, Deus Ex, Empire, Diablo, Total Annihilation, and Pirates. My biggest influences have been Sid Meier and Blizzard. I love how Sid finds the fun in games and I love how Blizzard doesn’t release until it is done. When did you decide to do this game? Did anything in particular create the seed? I was watching my wife, daughter and mom play Hexic on my 360 one night and I noticed them get frustrated when the board would lock up, because that meant it was the end of the game. I think they could’ve kept playing for hours otherwise. 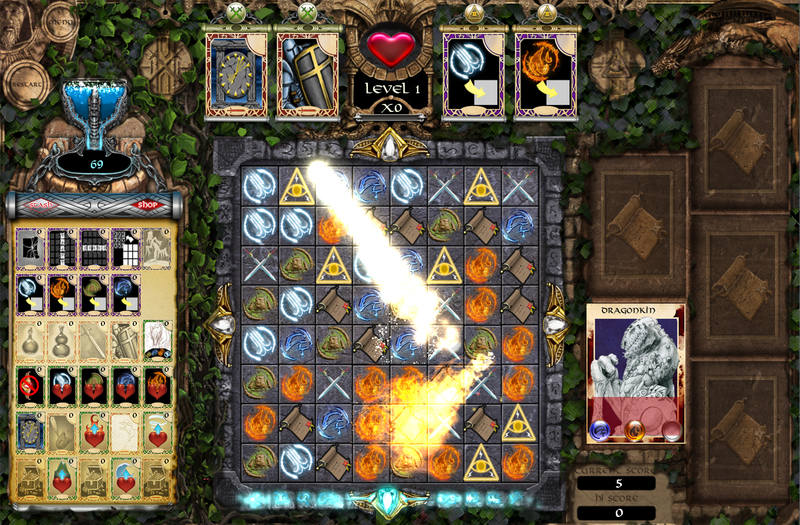 That is when I thought about making a Bejeweled type game that didn’t end when the board locked up. I also noticed that they liked completing bigger clusters since it was more of a goal than matching for a higher score. That is what made me think about creating Bejeweled with objectives. (that was my “and 1”). I decided to use cards for the objectives because cards make it easy to expand/add. How long have you been working on the game, and what's been most difficult? It took me six months to develop the original game. I asked publishers and people on forums what they thought, and I got the same response from everyone: they loved the game, but the graphics needed updating. So I tried to drum up some local talent to help redo the art. For about a year, though, the art went nowhere. Artists approach and handle things in a much different way than engineers do. I know that shouldn’t be surprising, but it is jarring when you experience it for the first time. It can be easy to misunderstand each other. I’m not saying that in a bad way--I actually enjoy working with artists, and can bring great ideas to the table. After that year of going nowhere, I decided to take a risk and fork out what I call “big money” to get a professional, veteran artist who could really make the graphics shine. Fortunately, I found a wonderful artist that I will always partner with in the future. I never thought my five-year-old daughter and my mom would both be playing and enjoying my game. I really thought my audience would just be traditional gamers, but instead it's appealed to a wide range of people. My friends, friends kids, and neighbors have all played and enjoyed it. I would show someone how to play, and then hours later I would have to kick them off my computer so I could go to bed.